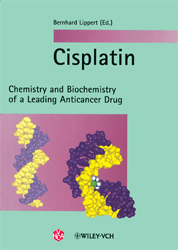 Cisplatin Chemistry and Biochemistry of a Leading Anticancer Drug Since Rosenberg’s serendipitous discovery of its antitumor activity, cisplatin has become one of the greatest success stories of cancer chemotherapy. The biomedical applications of this inorganic compound have had an enormous impact on the development of coordination chemistry, and have served to underline the critical importance of basic research. This book compiles in six Parts the various aspects of chemistry, biochemistry, biology, pharmacology, and medicine relevant to cisplatin, describing new links that suggest how cisplatin may trigger a cascade of cellular events that result ultimately in apoptosis. In Part 1, Rosenberg describes in a very personal manner the history of cisplatin from its accidental discovery to its establishment as a leading cancer drug. In Part 2 is described the current clinical status of platinum-derived antitumor agents. The biochemistry of cisplatin and current views of its mode of action comprise Part 3, while Part 4 focuses on the chemistry relevant to interactions of platinum(II) species with biomolecules. The examples compiled in Part 5 elucidate the impact of cisplatin on specific fields within inorganic chemistry, from the ‘platinum blues’ to platinum(III) compounds. The book concludes with Part 6, a description of several new developments in the field, e.g., orally active platinum drugs and the screening of combinatorial libraries of platinum compounds for antitumor activity. This volume provides all scientists, from coordination chemists to oncologists, with a unique resource detailing the state-of-the-art and future research perspectives, together with the fascinating story, of cisplatin. Platinum Complexes for the Treatment of Cancer: Why the Search Goes On. CISPLATIN - HOW GOOD IS IT? Clinical Status of Cisplatin and Other PT Antitumor Drugs. HOW DOES IT POSSIBLY? -BIOCHEMISTRY. The Response of Cellular Proteins to Cisplatin - Damaged DNA. The Mechanism of Action of Cisplatin: From Adducts to Apoptosis. Replication of Platinated DNA and its Mutagenic Consequences. Interstand Cross-Links in Cisplatin- or Transplatin- Modified DNA. CHEMISTRY RELEVANT TO PT-BIOMOLECULE INTERACTIONS. Platinum Complexes: Hydrolysis and Binding to N7 and N1 of Purines. Reactivity and Inertness of Pt-Nucleobase Complexes. Kinetics and Selectivity of DNA Platination. Structure and Dynamics of PT Anticancer Drug Adducts from Nucleotides to Oligonucleotides as Revealed by NMR Methods. 195Pt and 15N NMR Spectroscopic Studies of Cisplatin Reactions with Biomolecules. Structural Aspects of PT-Purine Interactions: From Models to DNA. Platinum-Sulfur Interactions Involved in Antitumor Drugs, Rescue Agents and Biomolecules. Diammine- and Diamineplatinum Complexes with Non-Sulfur-Containing Amino Acids and Peptides. INORGANIC CHEMISTRY REVIVED OR INITIATED BY CISPLATIN. Platinum Blues: On the Way Toward Unraveling a Mystery. Heteronuclear PT(II) Complexes with Pyrimidine Nucleobases. Displatinum(III) Complexes: Chemical Species more Widely Spread than Suspected. Inorganic and Organometallic Chemistry of Cisplatin-Derived PT(III) Complexes. Structure-Activity Relationships with Di- and Trinuclear Platinum Phase I Clinical Anticancer Agents. The Development of Orally-active Platinum Drugs. Methods for Screening the Potential Antitumor Activity of Platinum Compounds in Combinatorial Libraries. Computational Studies on Platinum Antitumor Complexes and their Adducts with Nucleid Acids Constituents. "In nahezu jeder anderen Hinsicht aber ist es eine lohnende Investition. Man muss sehr lange suchen und viele Originalarbeiten kopieren, um eine derart gelungene Darstellung eines aktuellen Gebiets der Chemie in die Hände zu bekommen!" Angew. Chem. 2001, 113, 266.